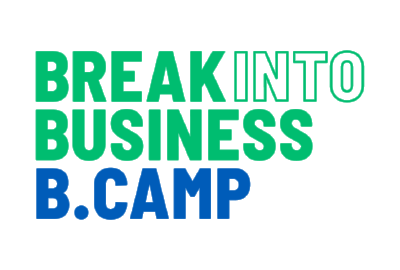 At B.camp, our entrepreneurs age 9-14 move from idea to pitch to profitable business in 5 short days. Join us to get your own startup off the ground in this action-packed week with focused sprints on idea generation, market research, brand creation, promotional strategy, budget crunching, and going to market. Note: All sessions are open to students age 9-14. Students work closely in age-based teams during the week. Camp sessions run from 9am-4pm each day, with before + after care available. Tuition is $445/week when registered before March 30, $470 after. REGISTRATION WILL OPEN WED 1/3. What happens during a week at B.camp? During a week at B.camp our entrepreneurs age 9-14 work toward launching their own REAL small business. They brainstorm a product idea, perform market research, design a logo, manage a budget, make a website, style an Instagram post, make t-shirts, distribute flyers, film a commercial, and enter the Shark Tank before making their first sale. Entrepreneurs donate 10% of profit to a charity of their choice and split the balance with their teammates. It's a week packed with learning, action, and fun. Do students return for multiple years of B.camp? Yes, B.camp students regularly return to our summer camps several years in a row. Typically a third to half of each group consists of veteran students. Returning students are given a more advanced title [Entrepreneur -> Executive -> Director -> CEO] and are continuously challenged as they seek to launch bigger and better businesses each time. We add all new material and challenges each summer to keep things fresh. Yes, a limited number of partial and full needs-based scholarships are awarded each year. Applications can be found at this link. Scholarship applications are due by 5pm on Friday, March 30. These scholarships are intended for families for whom the cost of tuition would represent a very significant financial burden. If your son or daughter has a friend or sibling who will be joining for camp, they are welcome to work together on the same team! Please indicate the friend's name on the designated spot on the registration form. Please note that we try to keep teams close in age so that we can tailor the curriculum and experience. If siblings are more than 2 years apart we ask that they work on separate teams. We ask that each student join B.camp with a completely open mind as to what business will be pursued. The entire team of 3-4 students must be in enthusiastic agreement about the business idea. However, students regularly take the skills learned at camp and apply them to grow their own business (we find that they need strong fundamentals in a one-week bootcamp first). Our fall program, The Accelerator, is a perfect next step for students ready to take their own business to the next level. My son/daughter requires special assistance in a regular classroom environment - is B.camp a good fit? Unfortunately we are not equipped to support significant special accommodations in the B.camp program. Although our staff:student ratios are extremely low (6:1 or less), our students are asked to accomplish a lot in one week, so our Business Coaches are not able to offer 1:1 focus to individuals at the expense of the team. Disciplinary problems will be handled in a "three strikes" manner, with parents notified for each strike and the student asked to leave the program without a tuition refund in case of a third strike. In case of individual questions, please reach out to info@breakintobusiness.com.